You know, a while back I did an interview which was one of my very favourites with Rob Jones from the Delete Bin (who is fantastic.) 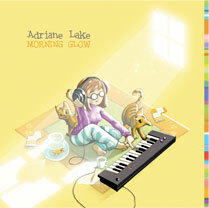 He asked really thoughtful questions about Morning Glow, and my experience scoring a video game. I actually can’t remember if I ever linked this interview on my blog, so here it is now! 🙂 Enjoy! Where in the world is Adri? Hi all! It’s been a fairly long absence from sharing any new posts on this blog, it’s true. For one, I am never sure what to say that has any value. On Twitter, a 140 character medium, I have a bit more luck as many small observations can be made in one line. But writing something worthy of a few more characters seems like a daunting task sometimes! Yes, I am in school and I’ve been taking eight courses at a time which is no small load. It’s been a huge privilege and I’d even say it’s been transformative… but it’s not left time for many other peripheral pursuits. For this reason I haven’t done many other things I wish I could have done for the sake of focusing on my classes. Currently, I’m in final exams. I have seven in total to complete and just one down so far. Next week is “skills” week where we basically have to perform one on one agility tests involving playing musical motifs, pieces and various other skills tasks. It’s the most terrifying week of the term, when even the most stoic calm-as-a-cucumber players can get frayed to the core. For me, this time around it’s especially exciting because of some things going on family-wise which are also fairly stressful in and of themselves. Good practice for staying present, but I wish the universe hadn’t sent me this particular challenge at this particular time! Lyrics: Who Are the People in my Life? Who are the people in my life? Who are the strangers I deny? Wouldn’t it be nice if they could meet my eye? Wonder what they’re dealing with at home? Wouldn’t they be mothers and fathers? What happens after the credits roll? What happens after the show is done?